AMD announced it has achieved the Guinness World Record for the “Highest Frequency of a Computer Processor,” by overclocking the upcoming 8-core AMD FX desktop processor. 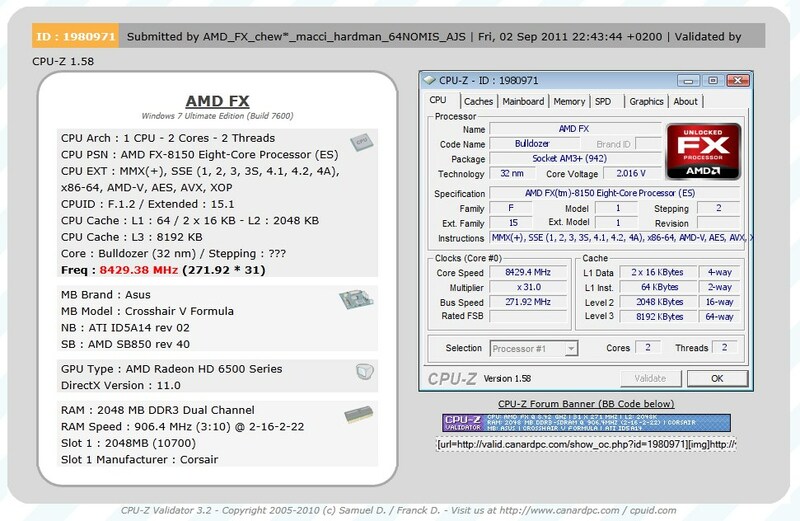 The record was set Aug. 31, 2011, in Austin, Texas, by “Team AMD FX,” a group of elite overclocking specialists reached 8.429GHz on an 8-core desktop CPU surpassed the previous record of 8.308GHz. 8.429 GHz was achieved using a base clock of 271.92 MHz with 31.0X multiplier. Cooling was taken care by a custom liquid-nitrogen setup. The team used liquid nitrogen and switched to liquid helium halfway, which has a lower boiling point. You can see the detailed CPUZ screen shot.